Wendy of The Shabby Nest requested a simple applique tutorial after seeing Barbara's cute birthday shirts on our last post. What a coincidence! I had just read a quilting article about applique and had started to put a tutorial together. We must be in sync this week, Wendy! It looks as if Barbara's numbers are hand-stitched in place. This is our humble attempt at a very simple tutorial for machine applique. For more detailed instructions for more difficult shapes, try this one. 1. Heat your iron on the "wool" setting. Iron a piece of Heat n' Bond (big enough to accomodate your shape) to the back of a piece of fabric for about 2 seconds per area until it adheres completely. 2. Cut the shape out. You can easily trace lots of cute shapes, but I'm just using a simple square. Peel the paper off the back of the Heat n' Bond. 3. Place the shape on the item where you want it. 4. Position your sewing machine needle somewhere on the shape. I'm starting at one corner of the square. I like my applique to just barely go over the edge of the fabric to prevent fraying. 5. Select zig-zag stitch and set your stitch length and width. Play around with it until you find the length and width you like. I like Length=1 and Width=4. If your shape requires a sharp turn like this square, stitch to the end of side and end with your needle on the right side (see below). Then turn and stitch the next side. If you're making a curve, like on the top of heart, mark a couple of spots around the curve where it turns. When you get to these marks, stop with the needle down and lift the foot. Turn the fabric slightly, put your foot back down, and start stitching again. 6. Continue around entire shape, backstitching a couple of times when you get to the end. Voila! Thanks again to Wendy for posting a request for a tutorial. If you ever want to see us try something (so you don't have to), just leave us a comment and we'll do our best! Thank you! This is exactly what I've been looking for. I want to make personalized pillows for my daughter's friends. Yea! Thank you!! I've been wanting to make the shirts with the "age" appliques on them for my kiddos and now I can! You're awesome! 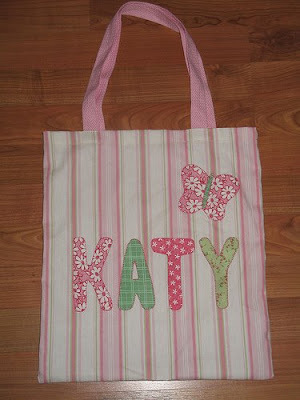 I'll have to try this to jazz up some of the bags I've been making! Thanks so much! I never knew making an applique could be so easy! thanks for posting! I've been a lurker for about 3 weeks now and am totally impressed at your craftyness! That's a great idea! I have about a million of those boring white onesies! thanks for this tutorial. it is so cute! Just found your blog (And LOVE it)and started following it. I posted a link to this tute on my favorite tutorials tab on my blog. Stop by and check it out, leave a button, follow, or just look around. Thank you! This is just what I needed, great step by step tutorial! This is a very helpful tutorial! Thank you! I do have a question though. I am new the sewing. When trying to create a topstitch it looks messy on the face side, but perfect underneath. Any idea what I'm doing wrong here?